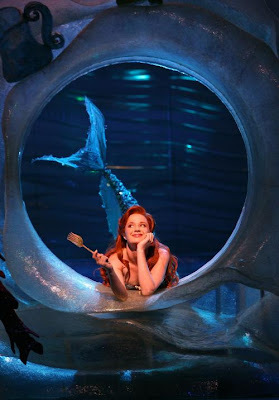 Last night (September 2) we saw Denver's pre-Broadway production of Disney's The Little Mermaid music. Denver has a great theater scene. We're lucky for that. Anyway, I thought I would comment. Anna Laura (5) and Alexandria (4) went. Anticipation was high. Each wore a princess dress. Alexandria wore a crown. As we shuffled into our seats, the beautiful theater teemed with excitement from Disney-lovers and the (20% or so) children there. This isn't going to be a long post, so let me jump to my review. First let me just state that between us, Kyndall and I have seen most major Broadway productions. We are not thespians, but we know what's good and how great Broadway productions can be – even in Denver (think Wicked). was quite beautiful at times as they represented refracted underwater light. They had to pull of the fluid motion of swimming. With roller skates they pulled off fluid, but the necessary suspension of disbelief was too high to ever belief swimming. They had to pull off a sinking ship and a drowning prince. With fly wires, Prince Eric truly appeared to sink toward Davy Jones' Locker. However, the ship was a genuinely goofy prop. They had to pull off Ursula the Octopus. Although they tried, a woman with eight legs and human legs to boot never resembled any sea creature. However, that actress was the cast's most dynamic member. They had to pull off the romance between Ariel and Prince Eric. A few quasi-romantic songs left you wondering what people really felt. It was a crazy confusion and a frustration. They had to pull off Vanessa, a beautiful courtier with Ariel's voice. This was solved by writing the role completely out of the story line. It was a painful loss my girls really missed. They had to pull off a rogue sailboat skewering the giant Ursula. This, too, was solved by writing the scene out of the store line. In fact, the story was changed so that Ariel rights Ursula's wrongs and the Prince was taught a tacky lesson that (to quote King Triton) "Ariel can rescue herself". It was a sad change and not an improvement. There were really lame songs and some even worse jokes. Sets were sparse and actors were overly reused, as were props. An interesting story was made long and boring. Fun characters were made confusing, cluttered, and occasionally risqué. Our girls think we loved it. But it's obvious they didn't. And for kids who like the new princess videos where the lips don't even synch with the words, their disapproval says a lot. Kyndall is convinced the show will get better once it goes to New York City. I think she may be right, but costumes, dialog, and songs need to be seriously changed. We were convinced that the convoluted dialog and strange choreography did little to convey the story itself. Had we not seen the movie first, we didn't think we would understand what was happening. Half way through the production, we started to try and identify what was missing. (That in itself says something about the production.) Today I realized what it was. You only understand what I mean if you have been to Disney World, Disneyland, a Disney "live" show, a Disney "ice" show, or seen a Disney movie. It's "Disney magic". It gives you the tingles and makes you want more. The Little Mermaid Broadway Music had none. As we fumbled back to our car we all felt it. What we anticipated – the Disney magic – wasn't delivered. Instead we just got this. Was it a bad cast? Was it bad producers? Was the theater the reason? Is it Denver? Whatever it is, something took an easy home run and foolishly tried to make something better – but they blew it. Your Tech Article is kool.